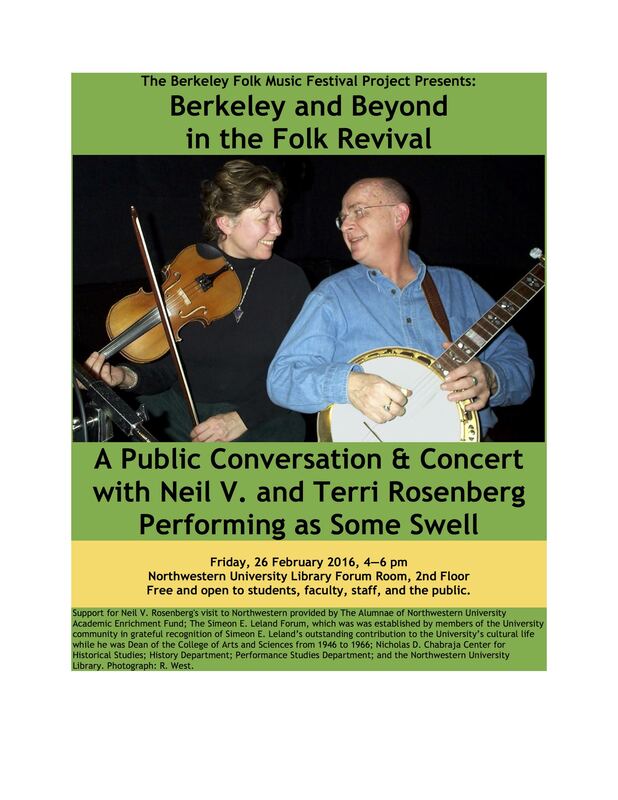 Neil Rosenberg, folklorist and author of Bluegrass: A History is visiting Chicago this week. He and his wife Terri will be part of a public conversation and performance on Friday (2/26) at the Northwestern University Library in Evanston. On Tuesday, they dropped by the Old Town School of Folk Music for an invitational jam session with a dozen bluegrass and old-time instructors and students (see below). A professor emeritus at the Memorial University of Newfoundland, Neil Rosenberg has spent his life in the midst of living folk music traditions. Raised in Berkeley, California, he was heavily influenced by the Berkeley Folk Music Festival in the late 1950s. He attended Oberlin College, an early outpost of the old-time and bluegrass music that followed the folk revival. After graduating in 1961, he made his way to Bloomington, Indiana and began graduate studies at the Folklore Department at Indiana University. Just a half-an-hour drive away was Bill Monroe’s Brown County Jamboree, run by his brother Birch (this was four years before Monroe’s famous Bean Blossom Bluegrass Festivals began). Young scholar Rosenberg soon found himself a member of the house band at this weekly country music show. Upon receiving his PhD, Dr. Rosenberg joined the Folklore Department at Memorial University in St. John’s, Newfoundland, where he became a colleague of the estimable Herbert Halpert (1911-2000), a pioneering folklorist among whose achievements a collecting trip to Mississippi in 1939 looms large. Dr. Rosenberg continued Halpert’s careful study of local folk music traditions, while also continuing his thorough scholarship along the pathways blazed by bluegrass music’s founding generation. It is a true joy to welcome gentleman and scholar, Neil Rosenberg and his fiddling wife, Terri, to the Windy City.